Ian Chapman remembers Brighton & Hove Albion getting promoted into the top flight of English football in 1978 and says it will be fantastic to see the Seagulls – his team – in the Premier League. Now manager of Ryman League Premier Division side Burgess Hill, Chapman, a hard-tackling left-back, is Brighton through and through. He watched the club at the Goldstone Ground aged just three, was the club’s then youngest-ever player when he made his debut in 1987 and went on to play 331 games for the club. He was released when player of the year in the penultimate season at the Goldstone Ground but holds no grudges about that and moved to Gillingham for two years, where a cruciate knee ligament injury ended his career. An attempted comeback at the Seagulls failed and he has since managed Whitehawk and Burgess Hill, in-between 19 months back at Albion as coach to Dean Wilkins. Having seen the club promoted into the top echelon of English football once before, Chapman is relishing the opportunity to support the Seagulls in the Premier League: “It’s massive and the club deserves it so much. “It will be brilliant for our football club to have Premier League football. The fans have stuck by the club through thick and thin and they deserve this reward. Chapman progressed out of the Lilleshall School of Excellence and played for Albion’s first team at Birmingham aged 16. 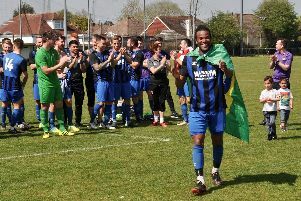 He said: “I played local football, starting at Whitehawk as a kid, and I think every kid’s dream is to be a pro footballer. As soon as I got to 12, 13, 14, I just started to improve massively and then I went to Lilleshall at 14. With Tottenham Hotspur playing their home matches at Wembley next season, the Seagulls will return to the home of football for the first time in more than a quarter of a century. Chapman was part of the last Brighton team to play at Wembley, the 3-1 defeat to Notts County in the 1991 play-off final, as the Magpies reached the Premiership. He said: “It probably didn’t hit me at the time as I was 21 or 22, and we had a chance to get to the Premiership. We lost to Notts County in the final but at the time you think it’s going to happen again the next year. That’s your mindset as a footballer. “That was one of my fondest memories but I also played at Old Trafford a couple of times in the cup, we played Man United at home and we played Liverpool. Chapman was released by Jimmy Case at the end of the 1995/96 season and said: “I didn’t want to leave as I loved playing there. “I never got the chance to say goodbye. I got the player of the season award and then the game with York was abandoned after 15 minutes and I never played in the rearranged game as I got a slight injury in training. “That was my biggest regret that I never got the chance to say thank you properly to the fans because I’d had ten years I loved at the club. “I played with Jimmy and I got on all right with him and I still speak to him but sometimes people come in and they want to change things and get rid of people who have been somewhere a long time. “That’s how football is. On the management side, you’ve got to make decisions sometimes and that happens. At the time I was really disappointed because I thought I was one of our best players but that’s in the past now. Chapman played 31 times in two years at Gillingham, before suffering a cruciate knee injury. He later attempted a comeback at Brighton but said: “Jeff Wood was manager at the time and it was something that definitely interested me but I played in five or six reserve games and used to get a real deep knee pain after matches. “I went to see the speciallist and they weren’t sure if it would be there a day, a week, a month, so I couldn’t sign a contract if I wasn’t sure I was going to play. “It wasn’t fair on the club and it’s not the way things are done. In the end, I spoke to the medical people and they said I should think about retiring, which is what I did. “Back then, the return rate was about 50-50 but now it’s probably 100 per cent. Football moves on, it evolves and it’s great nowadays that if you do get an injury it’s not a massive problem. Six years as Whitehawk manager followed, a role which started out as a favour, before Chapman returned to Albion in October, 2006, initially part-time under Dean Wilkins. He said: “At the end of the season, Dean asked me to go full-time which I did. I had one year with him and we came seventh and did really well. “Dean got sacked but, again, nothing surprises you in football. Micky Adams came in and he said I could stay but I didn’t think it was right. Chapman then had four years out of the game, before taking charge at Burgess Hill. He guided the club to promotion into the Ryman League Premier Division in 2015 and kept them in the division with a injury-time winner last season. He has also taken great pride in seeing young players progress, with Greg Luer joining Hull City a particular highlight.